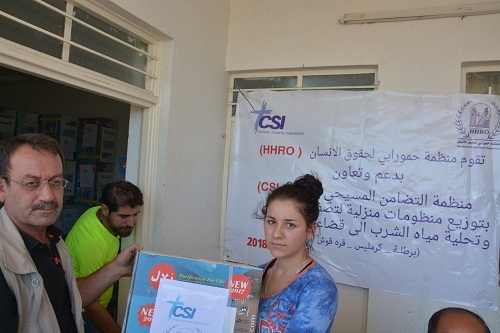 A new humanitarian relief program for Hammurabi Human Rights Organization included the distribution of 705 household systems for water purification and desalination with the support of CSI organization. 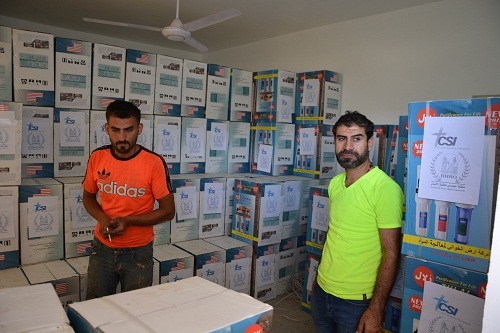 Beneficiaries of 960 families from Bartala, Karamlis and Hamdaniya "Baghdida" of these systems. Mrs. Pascale Warda, Mr. Louis Marqus Ayoub and Mr. William Warda supervise the distribution of these systems on the ground. 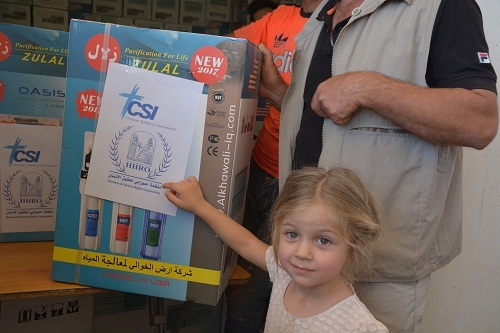 The Church Services Committee and citizens assist Hammurabi team in distribution. Residents of Bartala, Karamlis and Baghdida hail the step, stressing its high service importance to protect the health of returnees. 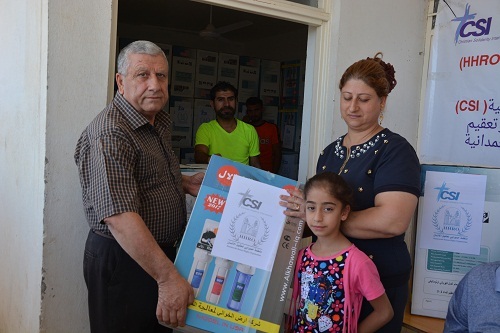 Distribution of (205) of these systems included (349) family of Bartala, while distributed (100) system to (172) family in the town of Karamlis, and the largest share of distribution was for the district of Hamdaniya center "Baghdida" of (400) system to (439) family. 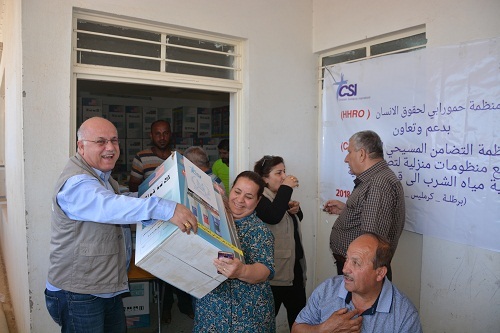 The distribution was supervised by Mrs. Pascale Warda, Chairwoman of Hammurabi Human Rights Organization, Mr. Louis Marqus Ayoub Vice President of the organization, Mr. William Warda, public relations officer of the Organization, and finally joined by Mr. Yohanan Yousef Tawaya head of the organization's branch in Erbil. The relief project team included Members of the General Board Amir Saed Mal Allah, Fares Shamoun, Stephen Noah, Luay Kamal Oraha, Cherbel Yousef The distribution was participated by Farhan Yousef and George Isa Yaqoub. 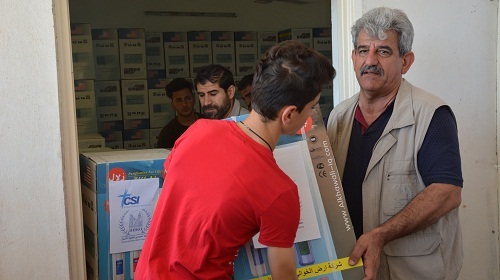 It is not the first time that Hammurabi human rights Organization is implementing a relief project of this capacity for returnees to Nineveh Plain, as it had already implemented a project with the same specifications in 2017 . 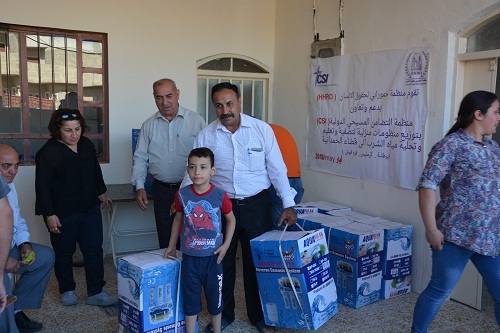 As during the past year the number of systems of water purification and desalination systems distributed by the organization amounting (602) as well as distributing (4) systems to the students of internal departments at the University of Hamdaniya. 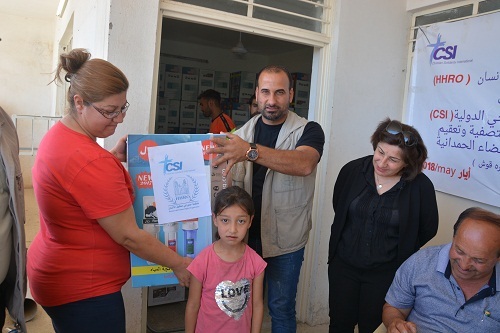 It is to be mention that the relief project implemented by HHRO was supported by Christian Solidarity International Organization CSI and that Hammurabi Human Rights Organization has decided to distribute this type of relief after several field visits to get acquainted on the reality of these liberated cities and towns. As HHRO found that the most advanced problem of returnees that should be addressed and need a solution is providing pure water for drinking and home service, since polluted water is an incubator environment for many diseases. 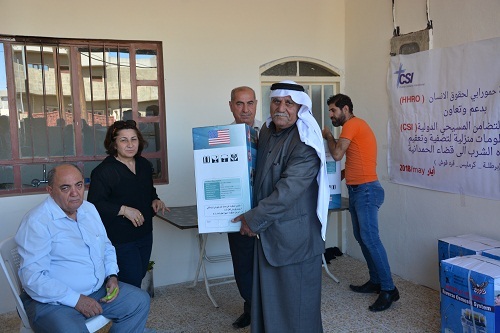 In fact, Hammurabi Human Rights Organization in its meetings with the families and depending on the observations of physicians and environmentalists who gathered that one of the measures that could be taken by HHRO is to protect the health of returnees citizens by implementing such project, since municipal governmental institutions is suffering from weakness because of the lack of necessary resources. 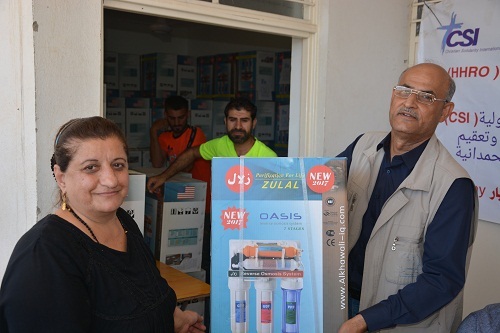 The distribution of these devices has witnessed a clear help from the youth of those cities and towns, also social figures contributed in the process of distribution, including George Isa Yaqoub the Mayor of Karamlis . 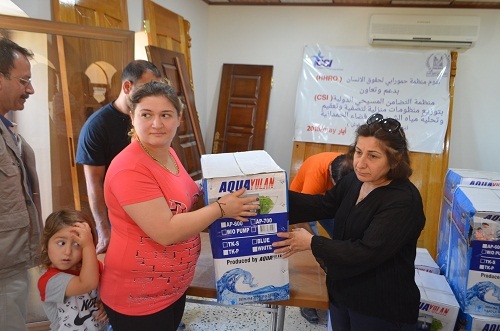 The household systems for water purification and desalination systems was distributed to Christian and Shabak families without distinction, and the Church Services Committee was also active in distribution. In addition, citizens of these cities and towns ask to the reporter of Nirgal news network to convey their gratitude and appreciation to Hammurabi Human Rights Organization on this important step for dealing with an issue affecting the health of citizens and that the achievement was a sincere expression of the requests of citizens there.